The protectionist tune on trade that U.S. President Donald Trump often sings is hardly a unique problem for Japanese policymakers who have long faced pressure over Japan’s strength in exporting everything from vehicles to video games all over the globe. But often lost in these disputes on trade is a question: Does buying more than one sells abroad — a trade deficit — amount to economic weakness? The famously mercurial U.S. president has almost never wavered in answering that export powerhouses such as Japan, China and Germany are sending too many goods to the United States. To ameliorate this problem, the U.S. administration has imposed a wide range of tariff hikes on steel and aluminium, threatened hundreds of billions of dollars in tariffs on China, and is now agitating for a new fight over automobile imports. As these tariffs take effect, however, it remains to be seen if these policies can truly correct a trade imbalance. In fact, many mainstream economists believe policymakers may have less power to correct trade imbalances than some politicians would suggest. Or to put it in Trumpian terms, it is doubtful Trump’s trade policies will truly help make American exporters great again. Are trade deficits a sign of a bad economy? The basis for Trump’s actions on trade is steeped in his logic that importing more than you export is an indicator of poor economic performance. While many politicians across the world take the position that surpluses are virtuous and deficits deleterious, a majority of economists believe a country’s trade position does not necessarily reflect the health of its economy. Japan provides a great case study as to why trade surpluses don’t always equal economic vitality. Even throughout the economic stagnation of the late 1990s and the 2000s, Japan maintained a large trade surplus in goods and services with the rest of the world. On the other hand, some economists believe there are in fact many instances where importing more than exporting is in fact a positive sign, as when countries use imports to increase productivity or catch up in economic development. “A trade deficit is not necessarily a bad thing because it means that consumers are consuming more and there is more investment happening in the economy,” explained Eswar Prasad, a well-known economist and senior fellow at the Brookings Institute in Washington, in a research note on tariffs. This is not to say that all trade imbalances are benign. A few well-known academics, including Olivier Blanchard, the former chief economist of the International Monetary Fund, believe trade imbalances were one contributor to the Great Recession in 2008. With that being said, there are very few market participants or academics who believe that unilateral trade sanctions are the appropriate way to correct imbalances. 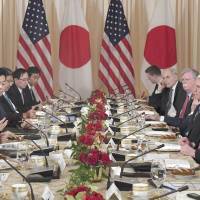 How big is the U.S. trade deficit and how much does Japan contribute to it? Measuring trade deficits can be a tricky business. When most people speak about trade it is usually in reference to goods, such as cars, TVs or your favorite brand of coffee. By this measure, Japan had a $69 billion surplus with the U.S. in 2017 — sending roughly $136 billion in goods and receiving $67 billion in goods, according to the U.S. Census Bureau. That means Japan has the third-largest trade surplus with the U.S. after China ($375 billion) and Mexico ($71 billion). But trade in services is also a huge part of international commerce, particularly for the U.S. and Western Europe, which no longer churn out large amounts of widgets but lead in such sectors as technology, finance and legal services — businesses without physical assets. If services are counted, the surplus with Japan shrinks to $56 billion, the Census Bureau says. At least in a historical context, Japan’s trade surplus with the U.S. is nowhere near a record high, either in gross numbers or compared to the size of the U.S. economy. In 2006 it was far higher, at almost $89 billion. Can Trump’s tariff policies shrink it? Perhaps. But the tricky question is at what cost? 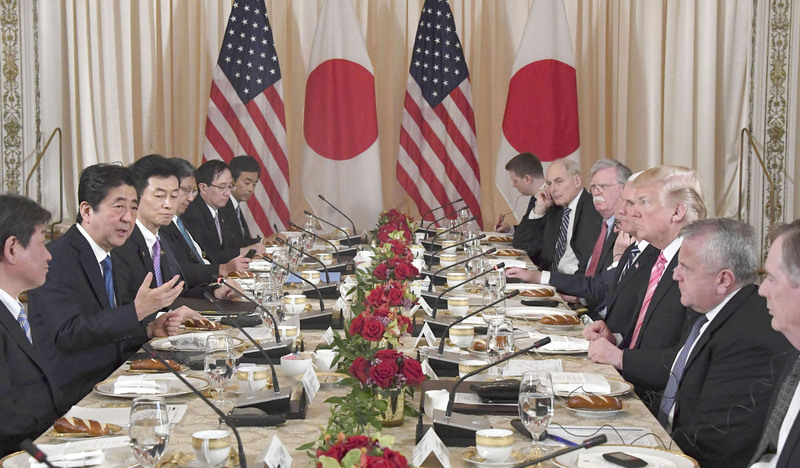 Japanese policymakers have thus far held their tongues in response to Trump’s trade threats. But if more U.S. tariffs are imposed, especially against automobiles, it is likely that Japan will respond with tariffs on U.S. goods. At the World Trade Organization, Japan has already signaled it might retaliate for the levies on steel and aluminum. The tendency to respond to tariffs with more tariffs is one reason why a restrictive trade policy is not likely to single-handedly solve trade imbalances. In the most extreme case, where trade comes to a complete standstill, the U.S. would be able to drastically shrink its trade deficit, but there are very few serious people who would suggest that would be worth the economic costs. As many U.S. firms have intricate supply chains, without the ability to import goods integral to production of their own services or goods, businesses would either have to temporarily shutdown or declare bankruptcy. Massive trade disruptions would eventually translate to fewer jobs and less economic activity. In fact some economists strongly believe trade deficits are the result of structural factors rather than trade policy itself. Thus, raising tariffs may have almost no effect on long-term trade balances. Can Japanese policymakers shrink it? Yes, but how much remains a mystery. During the high growth period of the 1960s and 1970s, Japan had in place many restrictions on trade and investment, barriers that have slowly been removed over the past few decades. Overall, Japan’s tariff levels are similar to its global peers. In fact, its tariffs on nonagricultural goods are less restrictive than those in the U.S., a 2017 country report by the International Monetary Fund Japan says. While President Trump is in some ways correct that Japan still guards some of its domestic industries, he is incorrect about where the protections lie. The U.S. has been quick to point to regulatory barriers, such as Japan’s onerous vehicle inspections, as the reason why it sells so few autos in Japan. Yet the argument does not seem to hold up to the success of the Germans, who sell hundreds of thousands of vehicles a year, according to the Japan Automobile Importers Association. Instead, most of Japan’s trade barriers exist in the service and farm industries rather than metals and autos. For example, Japan has high barriers in place for legal services, air transport, broadcasting and transport, according to an April 2018 report from The Organization for Economic Cooperation and Development. Japan is also well known for high trade barriers on farm products, such as rice and beef, two of the sticking points in the TPP. In theory, lowering these barriers could help U.S. firms sell more goods in Japan, shrinking the deficit. Another way would be to encourage its famously frugal households to spend more. The U.S. Treasury, which keeps Japan on a trade watch list, suggests that Japan spur “domestic activity, (to) create a more sustainable path for long-term growth, and help reduce Japan’s public debt burden and trade imbalances.” It could also pursue policies to strengthen the yen or to increase government spending, one experts says. “If the issue is trade imbalances then what we need for that is slightly tighter monetary policy with some expansionary fiscal policies,” said Hiromichi Shirakawa, chief economist at Credit Suisse. Shirakawa, however, admitted that neither the Bank of Japan nor the government appears to have an appetite for such moves anytime soon.